Storey Publishing, LLC, 9781612128672, 384pp. Widely acclaimed as “the Cheese Queen,” Ricki Carroll has guided thousands of home cheese makers and inspired the burgeoning popularity of artisanal cheese making with her classic book, Home Cheese Making, first published in 1982, with over 400,000 copies in print. The completely updated fourth edition features 35 new cheese recipes, color photography of step-by-step techniques, and new profiles of contemporary cheese makers. The additions to this comprehensive volume reflect the broader selection of cheeses available in specialty food stores and groceries, including burrata, stracchino, Brillat-Savarin, D’Affinois, Cambrales, Drunk Gouda, Pecorino Pepato, goat milk’s gouda, and more. Companion recipes are included for cheese plate condiments and classic cheese dishes. For cheese lovers wanting to make their own, Ricki Carroll’s expert advice is the key to success. 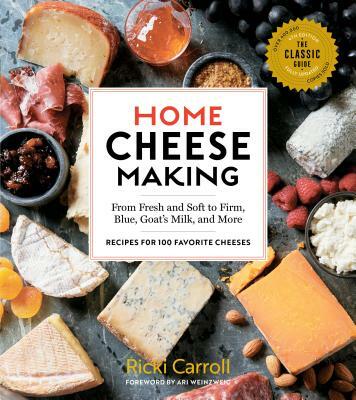 Ricki Carroll, aka “the Cheese Queen,” is the author of Home Cheese Making and the coauthor of Say Cheese! She owns and operates New England Cheesemaking Supply Company, an online and catalog company for cheese makers around the world. She is a founding member of the American Cheese Society and the recipient of their Lifetime Achievement Award. Carroll has taught home cheese making classes since 1980 and started the home cheese making movement in America. She lives in Ashfield, Massachusetts, and can be found online at cheesemaking.com. Ari Weinzweig is CEO and co-founding partner of Zingerman's Community of Businesses, which includes Zingerman's Delicatessen, Bakehouse, Creamery, Catering, Mail Order, ZingTrain, Coffee Company, Roadhouse, Candy Manufactory, Events at Cornman Farms, and the newest business, Miss Kim, which serves great tasting Korean fare. Zingerman’s produces and sells all sorts of full flavored, traditional foods in its home of Ann Arbor, Michigan. Ari was recognized as one of the “Who’s Who of Food & Beverage in America” by the 2006 James Beard Foundation and has awarded a Bon Appetit Lifetime Achievement Award among many recognitions. Ari is the author of a number of articles and books, including Zingerman’s Guide to Better Bacon (Zingerman’s Press), Zingerman’s Guide to Giving Great Service, Zingerman’s Guide to Good Eating (Houghton Mifflin), Zingerman’s Guide to Good Leading, Part 1: A Lapsed Anarchist’s Approach to Building a Great Business, Zingerman's Guide to Good Leading, Part 2: A Lapsed Anarchist’s Approach to Being a Better Leader, Zingerman's Guide to Good Leading, Part 3: A Lapsed Anarchist's Approach to Managing Ourselves, and Zingerman's Guide to Good Leading, Part 4; A Lapsed Anarchist's Approach to the Power of Beliefs in Business. In 2017 Ari was named one of “The World's 10 Top CEOs (They Lead in a Totally Unique Way)” by Inc. Magazine. “[Ricki Carroll] has inspired artisans from the Loire to Las Vegas. She’s the Billy Graham of Cheese.” — Barbara Kingsolver, from Animal, Vegetable, Miracle. “A must-read for anyone interested in cheese making!…offering abled cheese makers knowledge to excel at their craft and novices a world of information…” — Jodi Wische, Old Chatham Sheepherding Co.
“For 20 years, I have recommended [Ricki Carroll’s book] …for home cheese making help. Now Ricki has written an improved and expanded version to serve for the next 20 years.” — Laura Chenel, Founder and President of Laura Chenel’s Chevre, Inc.